Premium quality grip glove for cold conditions. • Latex coated palm for enhanced grip. • Warm, breathable cotton/acrylic insulated liner. • Suitable for most outdoor heavy duty handling tasks. 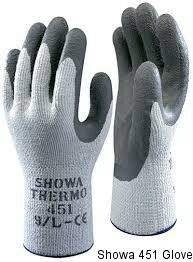 Provides outstanding insulation from cold conditions as well as high levels of grip. • Thermal terry loop acrylic liner. • Comfort and protection in temperatures down to -30°C. • Hi-vis yellow liner for increased visibility. • Seamless knitted liner for comfort. • Latex coating for secured grip. • Ideal for refrigeration and cooling plants. Approved to BS EN 388:2003, BS EN 511 and BS EN 407. 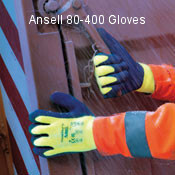 This glove features a unique HPT foam ¾ coating which remains flexible to temperatures as low as -50ºc. 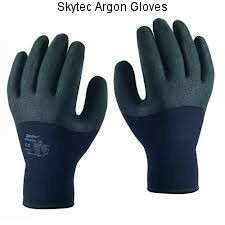 A breathable two-layer insulated liner also ensures that these gloves remain warm, soft and comfortable. Ideal for applications involving secure handling and high levels of dexterity in harsh conditions. 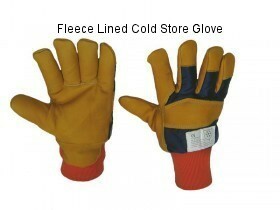 Yellow Hide Cold Store Glove. , Blue Nylon Back. , Thinsulate lined. Knuckle protection. , Vein Patch. , EN 511. 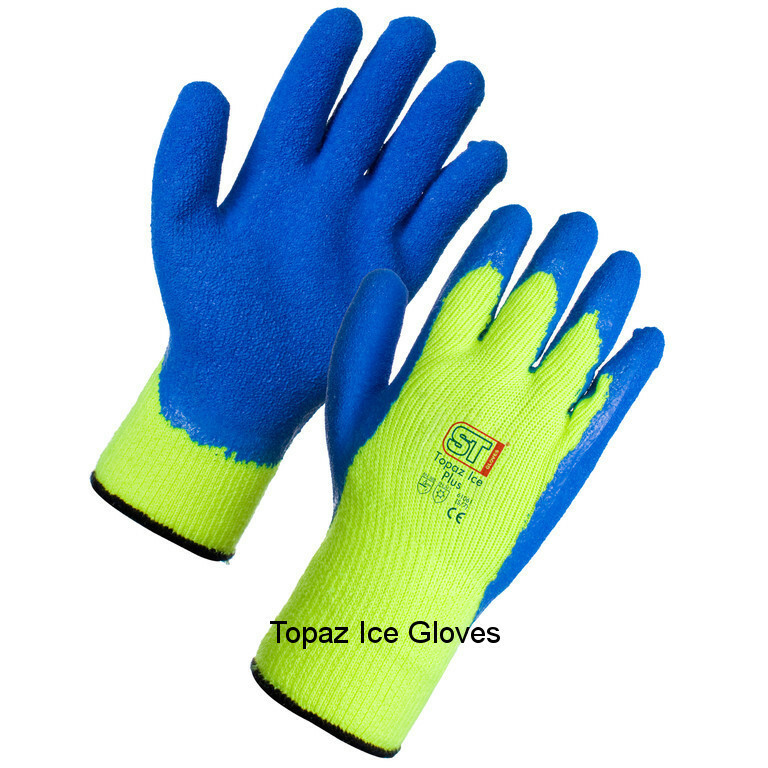 A warm, brushed terry lining and ribbed knit wrist make our Topaz Ice Gloves warm and comfortable to wear. 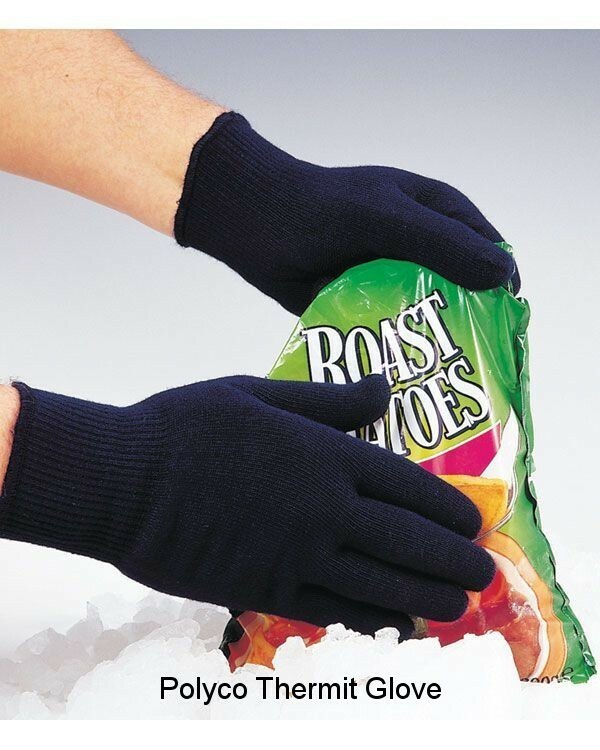 From cold stores to baggage handling, these gloves will protect you during the task at hand. The seamless liner provides exceptional comfort and reduces hand fatigue. The back of the glove is uncoated allowing the hand to breathe. Comfort The seamless construction will not irritate hands, even during prolonged periods of wear. Fit The Thermal yarn provides a close fit and excellent dexterity. Ambidextrous Fits either hand, increasing glove life and reducing costs.